Using salt to preserve meat was a widely used method well up until the 19th century. Salt is used to inhibit the growth of microorganisms by pulling all the water out of each cell within a piece of meat. Salted meat and fish are still staples in many parts of the world, such as the Arctic, coastal parts of Russia, North Africa, Southern China, and Scandinavia. 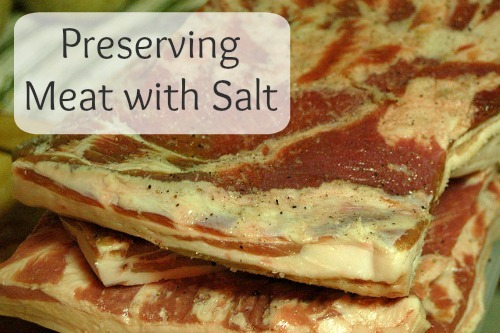 Preserving meat with large amounts of salt also means it doesn’t have to be refrigerated or frozen. Here’s how to preserve meat with sale, so you don’t have to worry about your extra meat source getting moldy, riddled with microorganisms, or just plain funky. Choose your type of meat to salt…pork, beef, fish, etc… and rinse it in cold or lukewarm water. The best types of meat to cure with the salting method are usually bacon, hams, or smaller cuts of meat. Shake off any excess water and pat the meat dry with a lint-free towel. Use kosher salt, or a mixture of kosher and iodized table salt, and rub a thin layer all over the outside of the meat. Make sure to rub it in well and to cover the entire outside surface. Being skimpy with the salt will enable bacteria to form on the meat and it will end up rotting. What a waste! Oh, and you can even mix in some herbs and spices if you want to, but you can always save those for later when it comes time to cook the meat. Find a cool environment to hang your salt-coated meat in. It should be someplace with a temperature under 50⁰F but above freezing. Allow the meat to hang in this cool area for up to a month or longer. Some information I read said you could store it up to a year, but I’m not positive about that length of time. If you have issues with flies, you can also wrap the salted meat in a coating of cheesecloth. It will keep the flies off of it, but still allow it to dry thoroughly. Check on the meat every few days, just to make sure it is actually curing and not rotting where it hangs. If it starts to smell funky, toss it out and try again. When it comes time to eat the salted meat, be sure to wash off as much of the salt as possible. You’ll then be able to cook it up and eat it in the recipe of your choice. Sailors commonly ate salted horse meat or beef on their vessels. This was such a huge part of their daily diet that the salty meat was often referred to as “salt junk” or even “junk” for short. So, in the 18th century, the very first “junk food” was the extra salty meat sailors consumed. What type of meat would you try curing with salt? This post is part of the Simple Saturday Blog Hop. My Italian neighbor celebrates the Christmas Eve tradition the “Feast of the 7 Fishes” … me not being Italian, I do not understand the tradition completely, but he is big into the Baccalà (salt cod) and one year explained the entire process to me. Sounded really neat. The idea was to preserve the Baccalà with the salt, or so I understood. I would imagine salting other meats works in the same manner. first off you have to have more than pure salt to cure meat as it won’t keep under salt alone! You have to have a certain amount of sodium nitrite to enhance the ability of the “regular” salts ability to penetrate the meat. Second when curing larger cuts of meat you need to break open joints and be sure to get plenty of salt into the joint as the bone marrow WILL spoil and ruin it. Third you must add red pepper and black pepper to keep the skipper flies away. If you see tiny holes in your meat that is a sign you have skipper fly maggots eating your rotten meat. Fourth, the meat needs to be placed on a shelf or flat surface to cure as it sweats as the moisture is being pulled out and it will wash the salt off if hung versus lying it on a shelf and putting a thick layer on it will still sweat but it doesn’t wash off as easily. Fifth, soak it in several changings of water for 12 to 24 hours before cooking will remove some of the salt taste if you don’t like the strong salt flavor. Finally, smoking the meat in a nut bearing wood at temps less than 100 degrees will seal it up on the outside after curing and this will pretty much make it keep forever. Sorry for the long post but I just think if you are going to the trouble to cure meat and undertake the expense of doing it it would be a shame to waste it as that could run into some serious cash very quickly. I really appreciate you sharing your expertise in this area! I know that not everyone salt-cures the same, but you made some pretty good points about the flies, storing flat vs hanging, etc. I know the people we used to buy from always hung theirs with no issue, but they weren’t in a hot area either. So, some of what you have to deal with probably depends on what part of the country you’re from. Do you have a site or blog? I’d love to talk to you about maybe being featured in a podcast interview on this topic! Actually, thin pieces of meat like fish and beef/pork slices will keep in just salt. Nitrates/nitrites weren’t widely available for thousands of years, so many times, they simply packed thin slices of meat into barrels or vessels of salt, or salt followed by a brine.